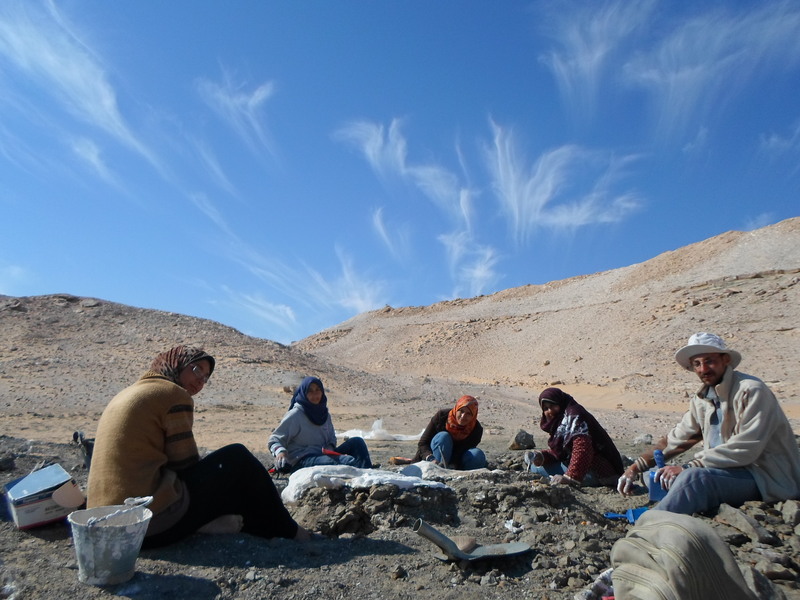 The story of the Mansourasaurus discovery began in December of 2013, when I received an invitation to give a talk about vertebrate paleontology at New Valley University in Kharga Oasis in southern Egypt. 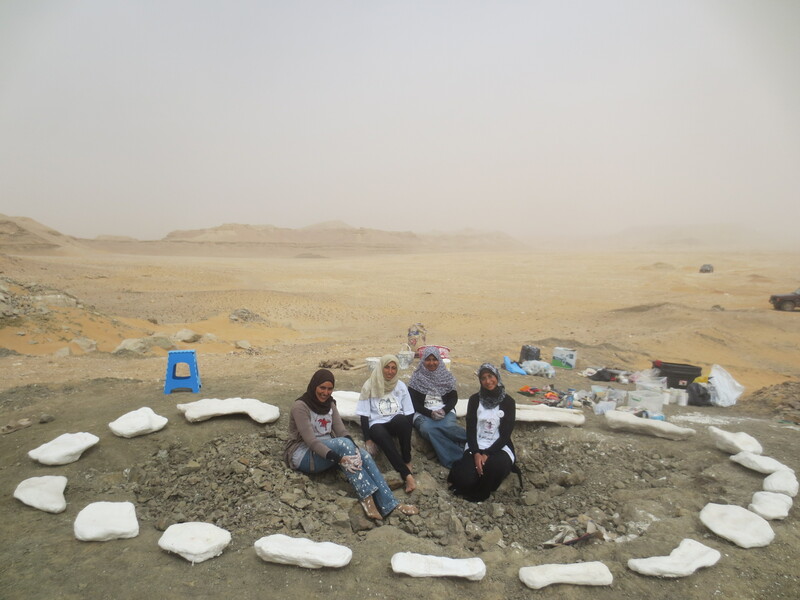 To get there I drove 12 hours with my graduate students from Mansoura University, Sanaa El-Sayed and Iman El-Dawoudi, who had just graduated and were eager to reach out to other Egyptian students about fossil vertebrates. On the way there we also picked up my third student, Sara Saber, from Assiut University. After the talk, we drove out to quickly have a closer look at the dinosaur-bearing rock exposures around Dakhla Oasis that I had been working in since 2008, with American colleagues from Ohio University, the University of Southern California, and the Denver Museum of Nature and Science. Our project aims to fill a ~30 million year gap in the Late Cretaceous fossil record of Africa, from which very few fossils of land-living vertebrates are known. As the sun was going down, I noticed a new road that could give us a view of some unexplored exposures, so the next morning we drove all the way to its end and found a gravel quarry. We had only half an hour to look at the rocks before the long drive back to Mansoura. Sara and I walked in the same direction, while the others headed off in different directions to cover as much ground as possible. Only a few minutes later, I looked over my shoulder to see that Sara was brushing something, which I assumed was probably a rock. I kept walking and a few minutes later my cell phone rang. It was Sara. I picked up the phone to hear her excitedly telling me to please come back, because there were fossil bones all over the place. I quickly returned to find that the area was indeed full of bones… the remains of an associated partial skeleton of a sauropod dinosaur. I noticed my footprints all over the site, and joked with Sara, saying “by the way, I saw it first but left it for you as a test.” She replied quickly, saying “no, professor, you stepped all over the bones!,” and we had a good laugh. It was one of those wonderful moments in paleontology when you know that something really important has just been discovered. I knew that we needed at least two weeks of fieldwork to properly excavate the skeleton, so we made the difficult decision to come back later and better prepared. Leaving such an important discovery behind made everyone incredibly anxious, because all of the bulldozers moving through the area could destroy the fossils in an instant. 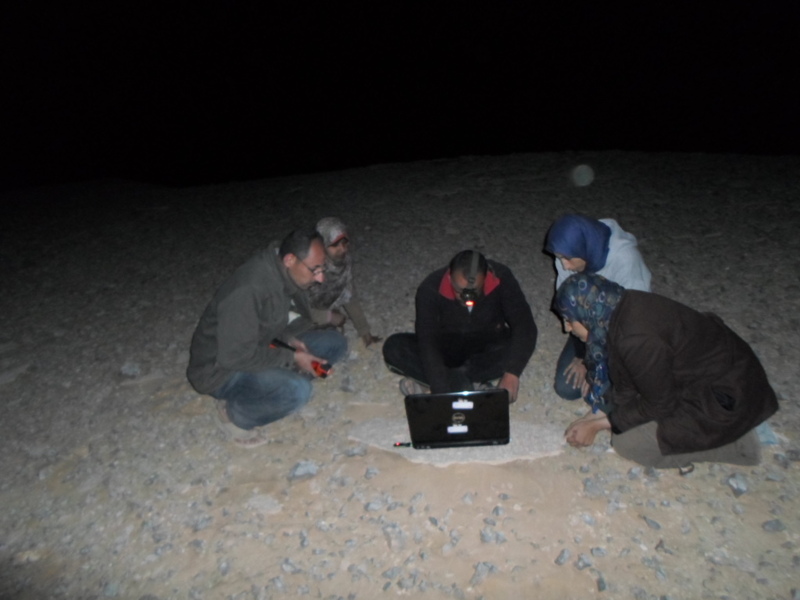 After two long months of preparation, we returned to the site with Sanaa, Iman, Sara, and two of my other colleagues, Mai El-Amir and Farahat Ibrahim. 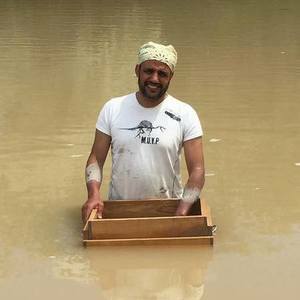 The excavation was difficult as the area is extremely hot, and we were hit with sandstorms and even pouring rain, but our enthusiasm kept us going, as we knew that we were writing a new chapter in the history of Egyptian vertebrate paleontology. Every evening, we went to the highest point in the area to get access to the Internet to learn more about dinosaur anatomy. On the third day we found the most diagnostic bone, the left dentary, from which it was clear that the lower jaw of this sauropod had a pronounced ‘chin.’ We were in close contact with our friends and colleagues in Egypt and the U.S.A., who were following the action daily. As time passed it became clear that we had skull bones, much of the shoulder girdle and forelimb, multiple vertebrae and ribs, part of the foot, and pieces of several dermal plates – more than was known for any dinosaur of this age from the entire African continent. While chatting with my American colleague Joe Sertich, he suggested the name Mansourasaurus, and it stuck. We ended up working at the site for three weeks, and by the time we were finished we had made 19 plaster jackets and collected loads of isolated bone fragments. When we returned to Mansoura, we brought the jackets to be CT scanned at the university hospital. Never having seen plaster jackets in the hospital before, some of the staff stopped us and asked what we were pushing around on a gurney. I told them it was a dinosaur. They were astonished! One man asked if it was sick… to which I replied that it had been dead for at least 75 million years! As time went on we would regularly meet up with our American colleagues over Skype, particularly the sauropod experts Eric Gorscak of Ohio University and later The Field Museum, Matt Lamanna of the Carnegie Museum, and Patrick O’Connor of Ohio University. Slowly the picture started to come together of just what we were dealing with. I think most of us initially expected Mansourasaurus to have been a member of a very ancient African lineage, given that continent’s hypothesized isolation during the Cretaceous, but it turned out that its closest affinities were instead with European sauropods, providing some of the first compelling evidence for the movement of dinosaurs between Africa and Europe in the later part of the Cretaceous. A find like this shows how little we still know about the Late Cretaceous of Africa, and has motivated us all to keep up the search for new fossils in Egypt. Mansourasaurus skeletal reconstruction (McAfee, Carnegie MNH): Skeletal reconstruction of the new titanosaurian dinosaur Mansourasaurus shahinae from the Late Cretaceous of the Dakhla Oasis, Egypt. Bones shown in color are those that are preserved in the original fossil; other bones are based on those of closely related dinosaurs. Image credit: Andrew McAfee, Carnegie Museum of Natural History. Well done Prof. Hesham and all the team. Nice job Hesham. Congrats to you and the MUVP students and collaborators on a job well done. congratulations prof. Hesham, god bless you. Congratulations on this amazing discovery! Thanks you for this hard work and passion.